This was a good study on James. Beth Moore does a fantastic job of commentary and explaining things. She is able to walk you through a book of the Bible and add some humor along with it. I did this study with a group of ladies and without the videos that can accompany her books, but had other teaching that went along with it. One of the things I like about Beth’s books include all the little “work” she makes you do along the way by looking up scripture and then asking you a question about it or just asking you a life question to reflect on. I learn more from “doing” rather than just “reading” so this was very helpful. I highly recommend this study for any woman wanting to study the book of James! James, Jesus’ own brother, started out as a skeptic. 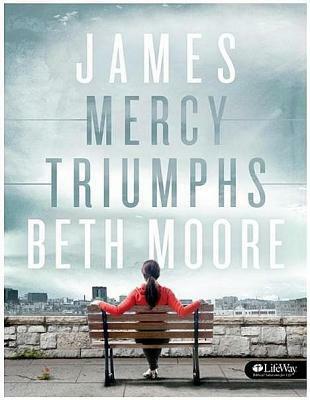 See how one glimpse of the resurrected Savior turned an unbeliever into a disciple with Beth Moore’s study James: Mercy Triumphs. Once you get to know both the man and the Book of James, you’ll never be the same again. Bible scholars compare James to the prophet Amos. In other ways, James more closely resembles the Book of Proverbs than any New Testament book. James is a book with many topics — social justice, joy, hardship, faith, reversal of fortunes for rich and poor, wisdom, gifts from above, single-mindedness, the dangers of the tongue, humility, and prayer — all of which are covered in this study.